Heat oil in a saucepan over medium heat. Cook and stir carrots and onion in hot oil until slightly softened, 3 to 7 minutes. Add tomatoes, spinach, garlic, thyme, parsley, salt, and black pepper; bring to a simmer, reduce heat to medium-low, and simmer until flavors combine, about 20 minutes. Cool slightly, 5 to 10 minutes. Puree vegetable mixture using a stick blender until smooth. Alternatively, pour vegetable mixture into a blender no more than half full. Cover and hold lid down; pulse a few times before leaving on to blend. Puree in batches until smooth. Mix pureed vegetables, ground beef, and egg together in a bowl with your hands until evenly combined. 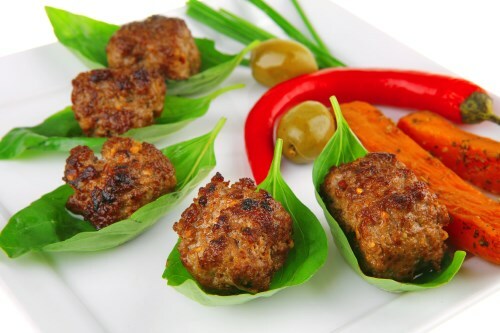 Divide meat mixture into 10 equal portions; form each into a mini-loaf and place on prepared baking sheet. Place 1 bacon piece on top of each loaf. Bake in the preheated oven until no longer pink in the center, 40 to 45 minutes. An instant-read thermometer inserted into the center should read at least 160 degrees F (70 degrees C).